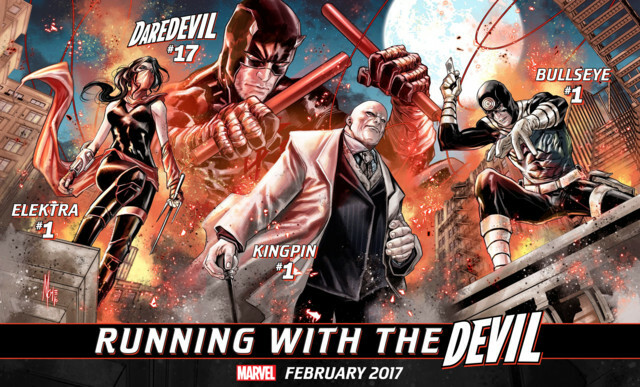 New York, NY—November 11th, 2016 — Marvel is pleased to announce Running With the Devil beginning this February! A brand new initiative, Running With the Devil spotlights a brand-new story arc beginning in the pages of Daredevil as well as the launch of three major titles for his closest friends…and deadliest foes! It all starts in DAREDEVIL #17, as secrets will be revealed! Blockbuster creators Charles Soule and Ron Garney team to answer the question on everyone’s mind – just how did Matt Murdock regain his secret identity?! Then prepare to delve into the mind of two vile villains in KINGPIN #1 from Matthew Rosenberg (Rocket Raccoon, Civil War II: Kingpin) & Ben Torres (Daredevil) and BULLSEYE #1 from Ed Brisson (Secret Wars Battleworld) and Guillermo Sanna (Deadpool). Finally, Sin City is about to get a new player in ELEKTRA #1 – from writer Matt Owens (Marvel’s Luke Cage) and artist Alec Morgan (Secret Wars Journal)! How long can Elektra escape her past when she runs afoul of Arcade and his new Murderworld?! The table is set and the pieces are on the board. As Elektra, Kingpin and Bullseye set off on their own paths, how long before all three come crashing back in to Matt Murdock’s life? This February, take a walk on the dark side when you’re Running With the Devil! For more information on Running With The Devil, visit Marvel.com. ComicBook.com has an interview with editor Mark Paniccia, where he talks about this new "Daredevil line" at Marvel. They're all very distinct. With each one of these, the first arc is to introduce the character to new readers and catch regular readers up with where the characters have been. Once that’s been established you’ll start to see more connective tissue. They are also stories that I think long time readers are going to love because so true to the concept of each one of these characters. These are meant to be the kind of stories that a casual fan will really enjoy and someone will be able to go, "Hey, you should check out the Elektra series." You can jump right in. It's just a really good Elektra story and it introduces her as what this core character. Every story puts all of the characters in a situation where you understand who and what they are.